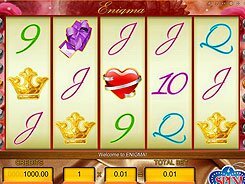 Enigma is a Gamescale-powered slot equipped with 5 reels and 9 paylines and is themed around love. The symbol set includes playing cards from 9 to Ace, gift boxes, hearts, heart-shaped pendants and other themed icons. You may configure a line bet from $0.1 to $5, so the maximum bet may reach $45 per spin. The slot features a wild, a scatter and a free spins round. The wild depicted by Kissing Couple replaces for other regular symbols and pays out a stunning $50,000 jackpot for five of a kind. The scatter symbol (Gold Rings) triggers a free spins feature, once you land three or more of them anywhere in view. Hitting three scatters awards 8 free spins, four scatters give 15 spins, and five scatters award as many as 20 free spins. Furthermore, two to five scatters that come up in any position award large payouts. For example, five of them pay your total bet times x400, so making the maximum stake you may win $18,000 for that combination. Anyway, Enigma is a visually appealing love-themed slot that offers massive payouts and an immersive gameplay. PLAY FOR REAL MONEY!